Yes, I finally have all the issues of Marvel Team-Up capturing the entire Spider-Man/Black Widow/S.H.I.E.L.D. saga. Now I can finally learn the truth about Nancy Rushman. Finally I can find out if S.H.I.E.L.D. has been infiltrated again, they call that Tuesday! It is time agents; let us jump into Marvel Team-Up #84. Silver Samurai and Boomerang appear to have control of a hellicarrier and respectable agents like Clay Quartermain’s mind. However the real mastermind is Viper, who launches into four pages of complicated backstory that links Marvel Team-Up to Secret Avengers volume 1 through the Serpent Crown. Viper’s plan involves using the firepower of the hellicarrier to devastate all three branches of the U.S. government (years before Captain America: The Winter Soldier). 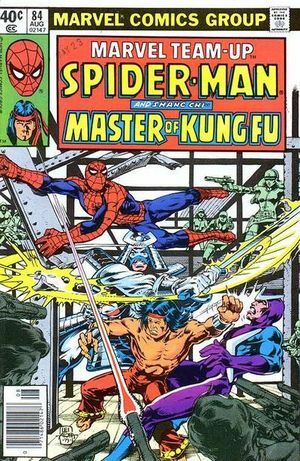 However, in two coordinated attacks, Rushman and Spider-Man infiltrates the hellicarrier while Nick Fury and Shang-Chi attack the villains. Can the good guys win the day? We still do not know if Nancy Rushman is Black Widow. Her body appears to have muscle memory that hints to the fact she could be the superspy. And Viper makes comments that lead us to believe that Rushman could be Romanoff…and she hates her so very much. But in the fight, Rushman lacks the confidence that one would expect from the Black Widow. She really could be an innocent school teacher. Rushman and Parker have a moment! Is it love? It is confusion? Or is it just the heat of battle? Okay, so S.H.I.E.L.D. has fallen…again. Seriously, this is the S.H.I.E.L.D. formula. S.H.I.E.L.D. protects the world. S.H.I.E.L.D. gets a mole(s). S.H.I.E.L.D. goes bad. Nick Fury rebuilds. And then repeat. So we really should not be surprised with the MCU rise and the fall of S.H.I.E.L.D.. It is Agent Coulson’s responsibility to rebuild until he can get suitable funding again. This is S.H.I.E.L.D.’s entire history. And if you see Hydra agents everywhere, well it is a pretty safe bet that not everyone with the jumpsuit is really a good guy! Let me say it…I am tense. Can Nick Fury, Spider-Man, maybe Black Widow, and Shang-Chi save the world! Well seeing how this Chris Claremont written with Sal Buscema and Steve Leialoha drawn story was released in 1979, the best bets are on yes. But will Rushman break Spidey’s heart? Now that Agents is yet to be discovered!